I am learning (slowly, slowly) how to love my life. I've always loved life in the "squeeze every drop out of it" kind of way. I'm over the teenager-y, wanderlust-y Pinterest prints about loving travel and good food and music. I mean, I'm not, because I love those things, but I don't think that makes me deep; it think it makes me normal. I've loved people passionately (foolhardily? ); I've loved travel and food and music, but that stuff is easy to love. When people cite these things as the reason they love life, I want to respond like Rosie O'Donnell in Sleepless in Seattle, "You don't want to be in love; you want to be in love in a movie." "You don't love live, you love life in a Levi's Go Forth commercial." The secret, I've found, is to take what is ordinary about your life and make it sacred; create rituals in everything. Take what is inevitable and make it an experience. The more you can engage all of your senses in a task, the more delightful and experiential that task will be. Think of your day, full of routines and chores. Now replace "routines" with "rituals" and "chores" with "experiences." Suddenly, your day is bursting. In each task there is something to delight in. 1. Clean the house. 2. Water the flowers. 3. Wash my hands. 4. Do the laundry. 5. Cook. 6. Run Errands 7. Write. It's easy for me to crave adventure, to feel like this life is somehow lacking in significance. (The truth is that my significance isn't found in my schedule, and even if it were, shaping the futures of children is not to be underestimated.) But I need to reconcile my feelings with the truths that I know. I need to delight in my life in reality, not just in theory and Sunday School answers. How is staying at home fulfilling - really? Here is how I've begun to infuse ritual, sacredness, surprise, and joy into my daily life. 1. Clean the house: The very first thing I do every morning - before breakfast, before music, before coffee, before praying - is pick up the living room. Then I finish any leftover dishes and wipe the counters with Ms. Meyers Lavender counter spray. I make myself a cup of hot tea and sip it in my clean living room - in silence. This is when I pray. Cleaning is awful when I'm doing it out of guilt or frustration or because there is someone coming over. But when I'm doing it for me - when I'm cleaning so that I can sip tea in a peaceful environment early in the morning - then it's sacred. Every toy, every scrap of paper that I put away is a part of carving out my peaceful place. My new "spacious place." 2. Water the flowers: I do this after my tea-sipping in the spacious place. If Sam is up (he usually is) I bring him with me. My mom made a path from my deck to my water spout; she understands better than anyone the importance of beauty in the details. I don't slop through mud, I walk up my path and turn on the water. Then I use a funky little cat shaped watering can for my little plants. A pitcher works, but I've never looked forward to filling up a pitcher. The cat makes it sacred. 3. Wash my hands: I get my soaps from TJMaxx. For $4 they have all kinds of alternatives to the grocery store's tired Dial products. I choose pretty packaging, colors to match my rooms, and clean scents that are definitely not generic. Since I wash my hands often, these soaps punctuate my day with pleasure. They are lovely to look at, refreshing to smell, and indulgent to feel. 4. 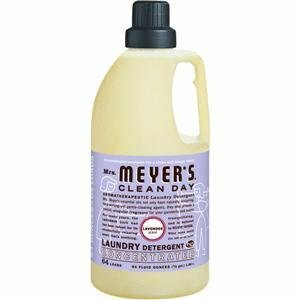 Do the laundry: I use Ms. Meyers Lavender detergent. I'm not just washing dirty clothes, I'm filling the whole house with the aroma of "clean." 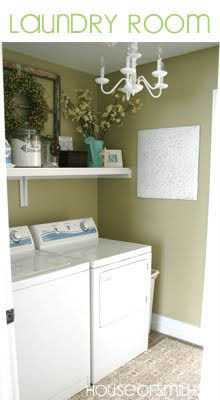 I have a vase of flowers sitting on shelf above my dryer (inspired by this photo), and a happy little "laundry" sign hanging there in the closet, where nobody can see it but me. When I pull back the curtains, I see my sign, see my flowers, and smell the lavender. Even laundry can be sacred. 5. Cook: No bones about it: I hate, hate, hate, hate, hate cooking. My kitchen is an area of my home that needs lots of little pleasures. I've filled my kitchen with the following: color, braille, my favorite soaps, indulgent spices, and some special pieces of servingware that are so pretty I actually enjoy filling them with food. 6. Run errands: I no longer toss coins in the bottom of my purse or in various nooks in my car. I use a little coin purse that makes me happy. I fill it up and use exact change as much as I can, because feeling it crinkle in my hands, feeling the heavy weight of coins all in one place, tugging the orange zipper, and looking at this happy little bird make paying library fines and drugstore runs more enjoyable. 7. Write: I have a very small, old desk, made of chipped, cheap, pressboard wood. It is wedged in a corner of a play room that is poorly lit and never, ever clean. But I've claimed this space as sacred with a collection of my favorite books, living, breathing plants in perfectly modern planters, and tiny unique picture frames full of treasures. Next to my computer sits a single anthropologie coaster for whatever I happen to be sipping as I write. What I'm learning is not to neglect the details for the adventure. I'm not great at schedules or self-discipline, but my soul longs for order. Sometimes, a vacation isn't as healing as a ritual. It's not refreshing to get away when you have to come home to the same old mess. I've found that infusing beauty and order into my days does more for my soul than daydreaming about faraway places (though there is still a fair bit of that). When you intentionally create sacredness in your day - when you invest in your home and in your rituals - your day is split wide open. Your eyes are opened to the beauty that is hiding in every corner. You get to watch things transform from drudgery to bursting with colors, smells, and sounds that bring you joy. I think that appreciating these little treasures is a way of being truly present. I stay at home, but my life is not small; it is bursting at the seams. Slowly, slowly, as I grow, my whole house is becoming a sensory experience that is perfectly suited to me. It's a way to love my home, my job, my life. Not the Levi's Go Forth parts of my life, but the whole thing. Over the next few days I'll be instagraming some of the treasures in my house with the hashtag #livingabeautifullife. Please join me and I'll feature my favorite reader photographs on the blog next week! Make sure to use the hashtag #livingabeautifullife and be inspired! This post was greatly inspired by reading Alexandra Stoddard's Living A Beautiful Life earlier this summer. Credit also to my mom, Jesus, and growing up.